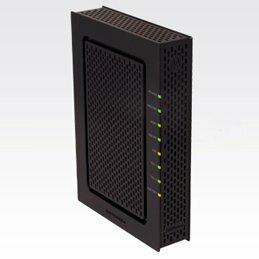 Motorola SBV6220 is a more advanced version of the SB6120 cable modem having two option VoIP telephone ports and providing speeds up to 160Mbps. With 64MB RAM and 16MB flash memory, which increases system's performance and handling, this modem comes with 4x4 bonded channels. Before purchasing, check with your service provider, as the SBV6220 can be supported for the internet but not for telephone service for most.